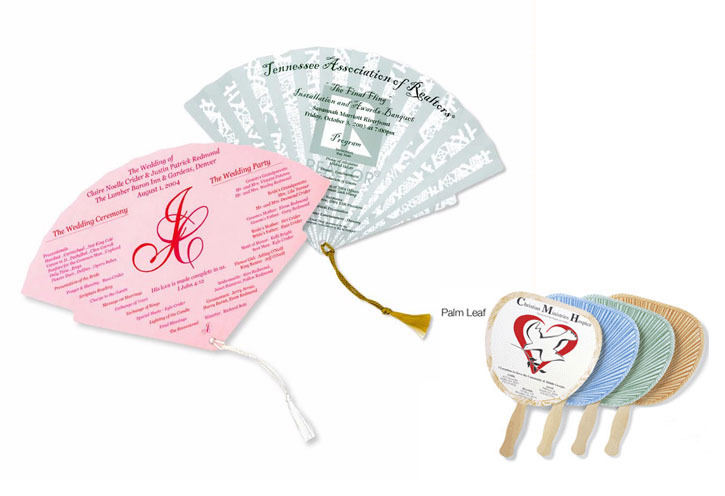 Our palm leaf hand fans are one of our highest quality hand fans. These hand fans are made to show absolute style. Perfect for any event where quality is important, these hand fans stand out from the rest making them a perfect advertisement tool. Price includes one color, one side imprint on white, 18-point board, which is coated on one side. Tassels are attached. Tassel Colors Available: Gold, White, Red, Blue, Black or Assorted. SPECIFY TASSEL COLOR ON ORDER. Imprint Area: See fan templates under Downloads tab. Extra Charges: Printing Plate: $37.50 per color, per side. FIRST PLATE FREE with camera ready art. Glue Handles: Wooden handles are stapled to the fan, and the staples will appear in the imprint. Add $.13 to have handles glued. Process Color Pricing: See General Information tab. PMS Color Match: $25.00 per color. No PMS charge for standard inks. Price includes your one color imprint on one side, with imitation palm leaf design printed in green, blue, or buff on entire back side with matching color border design on front side. Imprint Area: 6 1/2" x 7". Handle attached on Palm Leaf design side. Please specify Blue, Green, Buff or Assorted Palm Leaf Design. Extra Charges: Printing Plate: $37.50 per color. FIRST PLATE FREE with camera ready art. Glue Handles: Wooden handles are stapled to the fan, and the staples will appear in the imprint. Add $.13 (G) to have handles glued. Process Color Pricing: Call for details. We specialize in rush service, and offer it with many of our products. If you need your hand fans in a rush, feel free to call our friendly customer service representatives today at (800) 915-3535.